SO you want to learn mentalism? Which are the best books for mentalism? Well that question isn’t so simply answered by referring a single book. Each individual is different and will have gaps in their knowledge very different from the next person. So to recommend just one book is to assume everyone is in need of the same knowledge. If you are brand new to magic and want to get started in mentalism then I wouldn’t recommend a book specifically for mentalism. I would instead insist that you read Henry Hay’s The Amateur Magician’s Handbook or Magic for dummies. This is by far the best way to get a firm grasp of the fundamentals of magic and performing as a magician. If you jump straight into learning mentalism without the fundamentals of the general principles of performing magic then you may find yourself overwhelmed. Most of these books assume you already have some background in performing magic. If however you are already familiar with performing and wouldn’t consider yourself a beginner then the following books are the ones i would recommend as essential books for mentalism. 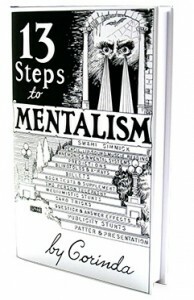 If you already have a decent background with magic and want some books that will teach you mentalism then I recommend that you get two books the first is “13 steps to mentalism” Bob Cassidy refers to it as “This is the best most complete introduction to mentalism ever written”. The second is “Practical mental magic”. This is a pretty generic answer if you look in magic forums this is the typical answer you will find and for good reason.There are a lot of books out there that are very poor and give out generic information and are really unimpressive. Stick to books that teach the fundamentals of mentalism so you can build on them. Many of the titles mentioned below are considered essential reading by the majority of mentalists. Where to begin with this book? if you ask anyone within the mentalism circles to recommend one book this will undoubtedly be mentioned time and time again. The saying “if it isn’t broke then don’t fix it springs to mind” this book has been the leading resource for learning mentalism since it was published in 1961 but it’s still as relevant today as it was back then. Originally it was written as 13 separate pamphlets each focusing on different aspects of mentalism such as mind reading, predictions, mnemonics and card tricks. Later they were compiled together into what has become the essential reading for mentalism. Most people will read it cover to cover first then use it as a reference book. It focuses on what you might consider “inside secrets” and practical application that you can easily follow whilst performing any of the huge array of tricks and illusions it will teach you from the very simple to the very complicated. The book can be a little difficult to read as it was written in 1961 and can feel a little dated but my advice is to not give up on it and stick with it and absorb everything it has to offer. To get the most out of the book you should probably have some props at hand such as a pack of marked decks and a nail writer. The books main criticism is that it is priced too low for all the information contained within it. Seriously that’s the main criticism other than a slightly dated writing style. Even if you just want to perform general magic without venturing into mentalism this book is frequently recommended. Cold reading is an essential skill to many mentalists. There are many ways of performing cold reading the more skills you have that can complement each other the better. Taking visual cues from involuntary body language from your mark is one of the most powerful tools in your arsenal. It’s well none by most people that most communication is done none verbally and body language can tell us a tremendous amount. Yet there are very few people who learn to read the subtle cues from someone else’s body language. This book gives you insight and teaches you how to speed read other peoples body language. Not only is this skill essential to most mentalists it also helps in general life. What better way to learn than from an ex FBI agent who‘s countries security depends on his ability to read peoples true intentions. Joe Navarro is a former counter intelligence officer is a world renown expert in nonverbal behaviour. He will teach you how to read others body language and control your own. You will learn that the face is the least likely place to gauge a person’s true intentions and you are much better secretly diverting your attention to look at a person’s thumbs, feet and eyelids to get a much greater understanding of what the person is actually thinking. The book is filled with lots of anecdotes from Navarros experience as an FBI officer. Its an amazing book and very popular and well received on amazon with 4.5 rating overall from over 636 reviews. Don’t miss this book get it at amazon. Are books the best way to learn mentalism? I would like to give a special thanks to Bob Cassidy as he has been an inspiration to the list of books here. A lot of the books made this list are here because of his recommendations in his book the fundamentals. He gives an essential overview of the best 39 books with regards to mentalism.